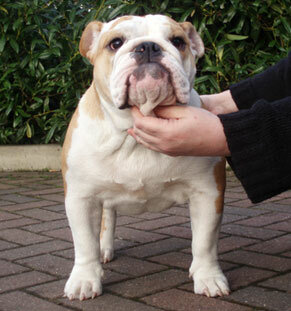 Name: Nickleby’s Shooting Star "Gracie"
About Gracie: Gracie is our latest baby girl, Gracie was bred by Terry and Denise Morgan of Nickleby's Bulldogs and the Dam is their lovely girl, Ocobo Daisy May and the Sire is David Tanner's of Bexbull Bulldogs, Bertie - Nobozz Polar Express to Bexbull. Gracie has the most sweetest of temperaments, she loves to be cuddled like a baby on our laps and snuggles her head into our necks and then she turns over and expects to just lay in our arms and we stroke her belly! Off course we just have to! Gracie is very fit and has to have an additional run everyday with my Sister's Labradoodle Slugsy, to keep her fitness needs met (plus Lola and Tia look forward to the rest!) She loves her toys, is always mischievous, and is a very special girl and a real pleasure to have in our family.